Carotid artery stenosis is a disease developed due to cardiovascular ­incapacity and cerebral infarction. Carotid artery stenosis is related with deep, subcortical, or cortical infarctions. In presurgery evaluation, asymptomatic dyslipidemia or symptomatic carotid artery stenosis are evaluated by imaging. Cardiovascular ischemia is occasionally interpreted as active and silent infarcts. 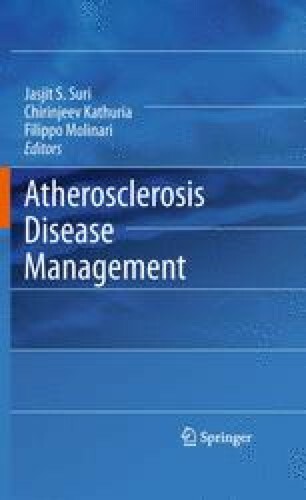 In advanced atherosclerosis, better information is extracted out from presurgery clinical symptoms combined with dyslipidemia evaluation and associated information from cerebral angiography, carotid duplex ultrasound, computer-assisted topographic angiography (CTA) and magnetic resonance angiography (MRA). In present chapter, the central idea is that carotid artery disease is manifestation of structural and or molecular changes visible in the carotid artery wall and physical characteristics of flowing blood. To evaluate the carotid artery disease burden and plaque type, a new criterion of ­presurgery evaluation was proposed in this chapter by imaging atherosclerosis followed by postsurgery plaque characterization using biomarkers in endarterectomy samples (changes in tissue expression of mRNA-encoded inflammation modulatory proteins, oxidation, lipid transport, calcification, proteolysis, or hemorrhage, oligonucleotide microarray analysis, and high in situ hybridization – GenePaint and immunohistochemistry – ProteinPaint) with or without statin treatment of carotid artery disease. Present time, new multimodal molecular imaging techniques are emerging to give better new insights of plaque staging by molecular events in carotid artery disease progress and its evaluation.